This page will contain articles of interest to the members. The perfect pond depends totally on your expectations, crystal clear water, beautiful Koi and lush water plants is usually what comes to mind when thinking about an ornamental water garden. Of course we all would like to think this is achieved by little to no maintenance and spending very little money in the process. Are you planning on entertaining around your pond? Do you want to see your pond from a window in your house? Maybe you've been inspired by someone else's pond and would like to recreate it with your influence. Do you have a theme in mind, say Japanese, English, natural, or even something whimsical? Your dreams can be attained simply by researching the correct elements involved with pond construction and pond placement. Once you have a full understanding of these elements you will then need to move on to what is in your pond and how it effects your pond quality. Be realistic and honest with yourself as to what your final fish count will be and stick to it, unrealistic numbers of fish often result in the death of the larger ones. The final chapter in pond owning is landscaping around your pond, with plants and hard structure's. A pond that has not been landscaped will always look as if it is waiting for the final brushstroke to finish the picture. Some plants need to be avoided just as much as some plants need to be incorporated in the landscaping around your pond. Elmer Smith and Fred Wild's wonderful pond. A filter will remove suspended particles from your pond water, see how simple that is! Next, a bio-filter will also remove particles from the pond water as well as house your good bacteria to colonize (grow in) in, again see how simple this is! You can build these yourself or purchase them already built, install them yourself or hire someone to install them. The difference between already manufactured systems and homemade is cost and in some cases the homemade can produce a better situation for colonizing more bacteria. If you are interested in building your own system, the Society has numerous books on the subject as well as AKCA guides on building different styles of bio filters. This guide also talks in depth about manufactured ones. Do you need filtration? Most certainly! Even if you decide to not have fish, you will still need filtration to have healthy water conditions. Carefully consider your options when deciding on what filtration and bio filter you install, this is the most important decision you will make. Cwill remove suspended particles from your pond water, see how simple that is! hoosing a filtration system can be overwhelming at first, just keep in mind what a filtration system does and it will be less confusing. Douglas Dahl has prepared a lecture on Koi-keeping, which can be downloaded by clicking here. 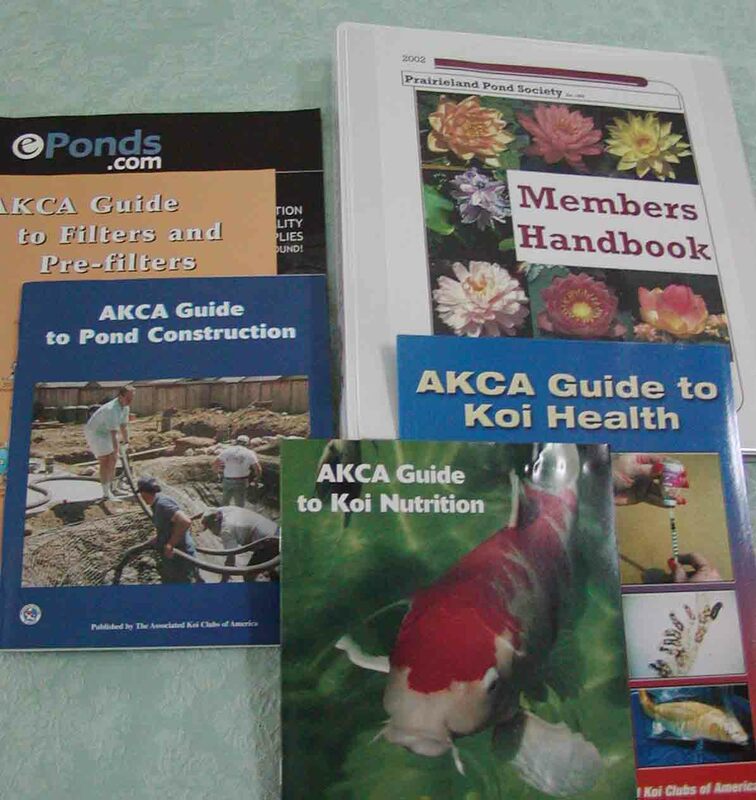 Each new member of the club receives a Members' Guide that contains a wealth of pond information. Updates are publised from time to time. The latest update covers fall shutdown of the pond, and can be downloaded by clicking here. Tips for a successful Pond! View as many ponds as possible before building yours. This koi was in a pond that had the electricity improperly installed and was electrocuted. The crooked body shape is a permanent disfigurement and he does swim in circles. Most fish do not survive electrocution. Your pond will require an underground electrical cable from your homes source, then you will install a properly installed ground fault interrupter outlet that will protect you and your fish by disconnecting the power when the conditions occurs. Always use GFIs when electricity is around water. Some of the reasons you will need electricity is to run your pumps, lighting, pond heater in the winter, additional aeration when needed, additional water features or spitters. It is also suggested to add an additional circuit with its own breaker for just the pond, this may require an electrician to accomplish this. This is the most important step in creating a pond, electrocution can occur to you and to your fish, which can result in death or fire. Do not use extension cords or other quick, cheap methods to run your pond, one mistake can last a lifetime. New concrete can leach lime into the pond water, so you must either coat it with liquide rubber or allow it to cure for several months, checking your pH every week, you may have to refill your pond several times before it is at an acceptable pH level for fish and plants. Treated lumber can be a deadly mistake for pond owners, aged wood could be the answer. Many types of treatments is used to preserve wood, unfortunately all are deadly for your pond. Arsenic poisoning symptoms are disorientation, inability to swim up right, swim bladder failure and a very strange fearlessness. Your fish will swim in a tornado style swirl, eventually dying. You can do huge water exchanges or simply not use treated lumber where it may touch the water or where run off will occur. Remember redwood is also lethal to Koi, as well as copper. peach girl. 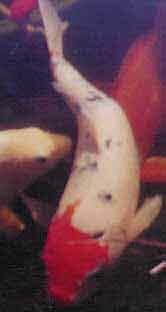 browney, sam, goldheart- naming your koi can be a chore! The placement of your pond may be predetermined by your existing landscaping and the availability of electricity. If this is the case you will need to make good decisions as to the practicality of placing your new pond in an area that may not be suited to support a pond. Too many trees, wind exposure, drainage all of these elements can create a headache pond instead of your dream pond. Lets assume you have free choice as to where you put your pond, use this check list for concerns that need to be addressed. Sun/shade: The best choice would be a full sun situation in the morning and part shade in the afternoon. This can be achieved by trees blocking the sun in the afternoon, yet far enough away from the pond to prevent leaves from falling in the pond. Wind: Wind can be your worst enemy! Evaporation and water blowing from your waterfall or spitters can quickly cause a pond to be at a constant needing to be fill stage. You can create your own wind break situation by adding a hedge, trees or even a structure as a gazebo. If you decide at add a fence as your wind break keep in mind that a solid fence structure will create more of a problem, so for maximum effect, your fence should be 50% permeable. This will break up the air currents instead of deflecting the full wind effect some where else in the garden by using a full fence. The Waterfalls should never be facing the wind or have the wind blowing across the waterfall, this can also lead to water loss. Run off: Placing your pond in the lowest area in your yard allows all rain fall, run off; such as dirt, debris, grass fertilizer, and other pollutants to flow into your pond. What doesn't run into your pond may run behind the liner and can cause a balloon effect in you pond, pushing the liner up with ground water and run off under the liner. After a few hours this will drain away leaving your pond in a very low water situation, this can leave your pump with out water causing it to burn up. Low lying areas are also subject to frost pockets. Construction: If you plan on using a mechanical way to dig your pond keep in mind that mature trees and shrubs in the surrounding area need to be protected. Driving within 10 foot of a tree can cause compaction of roots and often results in death to the tree within a few years. Digging to close to a tree can also damage the root system and may blow over in a storm, hopefully not into your pond. 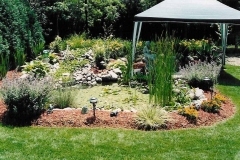 Borrow a view: Your neighbors landscaping can be utilized as a backdrop for your pond, walk around all sides of the potential pond location to see what is part of your ponds aesthetic consideration. You might also have inherited an eyesore, so be critical when spotting your ponds location. Proportion, proportion: A large pond in a small garden can actually defeat your purpose of a balanced yard and landscaping. Utilize large plantings to complement the over sized pond, this will direct the view to proportional sized objects other than the pond. The same applies to a small pond in a large yard, rather than placing a small pond directly in the middle of a large yard, nestle it in a corner or among plantings surrounding it as a hidden treasure. Supporting Materials: The surrounding materials that you use can contaminate your pond, treated lumber can be treated with arsenic or other toxic chemicals. Consider using aged lumber or some of the new plastic and cedar mixed lumber. Redwood is also toxic to fish and plants, even runoff contaminates the pond. Soft rock and marble should also be avoided , limestone will leach lime into your pond, raising the pH levels. Anytime you use something around your pond first ask yourself, is this fish safe? All members of Prairieland Pond Society receive members guides.